Bozack, A.R., Kern, C., & Whelan, R. (2017). Leveraging Induction to Inform Next Generation Science Instruction: Changing communities of practice. Proposal prepared for the Annual Meeting of the American Educational Research Association. San Antonio, TX April 29-May 1. Kern, C.L., Bozack, A.R., & Whelan, R. (2017). Effect of long-term supportive professional development on NGSS implementation. Proceedings of the National Association of Research in Science Teaching (NARST) Annual Meeting, San Antonio, Texas. Bozack, A.R., Kern, C.L, Whelan, R. (October 2016). 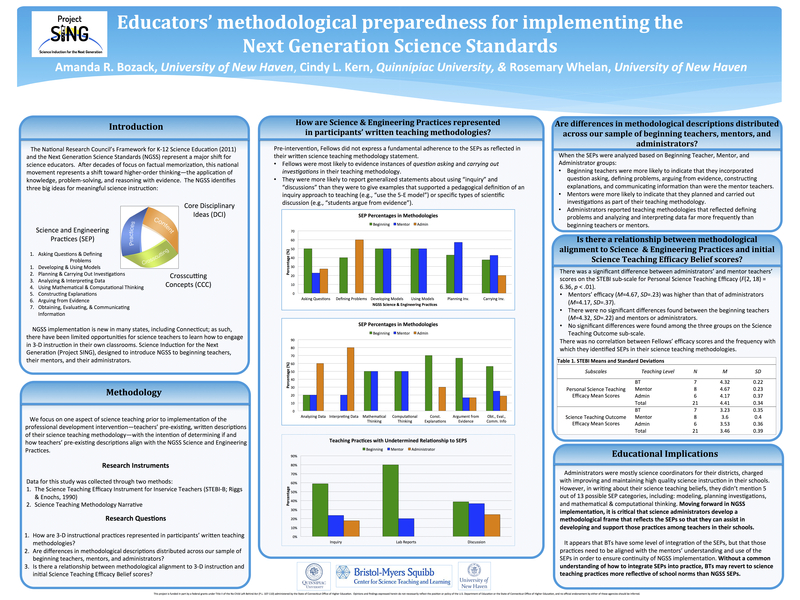 Educators’ methodological preparedness for implementing the Next Generation Science Standards. Northeastern Educational Research Association, Trumbull, CT.
Markello, E.C., & Wagner, A. (March, 2016). Launching Project SING – Graduate research assistantship, Education department – grant funded project. University of New Haven Graduate Student Showcase Spring 2016, West Haven, CT.
Bozack, A. R., Kern, C., & Whelan, R. (October, 2015). Educators’ methodological preparedness for implementing the Next Generation Science Standards. Annual meeting of the Northeastern Educational Research Association, Trumbull, CT.